We live in a humiliated and humiliating world. I’d learn some ago that the only way around it was to deal with the humiliation by growing humility. The other way was to become relentlessly uncompromising and non-conforming in my life and Art. Because a humiliated world knows very little about what’s true or about truth. It’s up to the personal accountability of the truth-seeker to establish the truth. And to grow integrity. URBAN CONVERSATIONS 2- DO YOU LOVE ME? Opening music by Kelvin Tan. A film by Wong Kwang Han. Please visit Aporia Society to find out more about Kwang's films. A DVD featuring 8 video works by artists Toh Hun Ping, Ong Kian Peng, He Shuming, Hiro Toshi, each working with a musical piece by Kelvin Tan. A wonderful collection of video (imageries) and music (sound) working hand-in-hand. 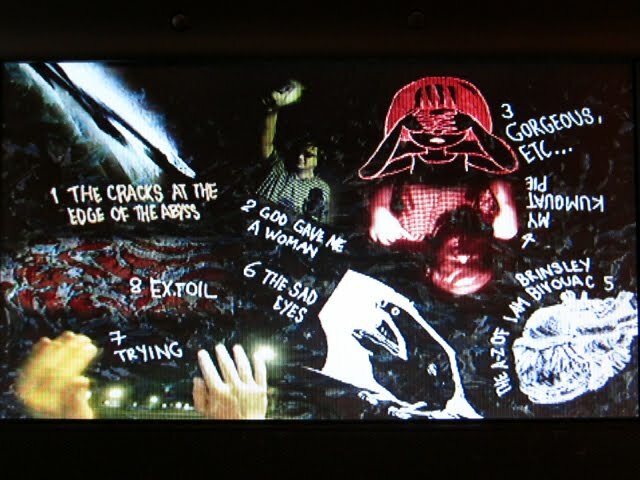 Main menu for video works inside the DVD. A collage of screenshots found inside Reconfiguring Axioms. 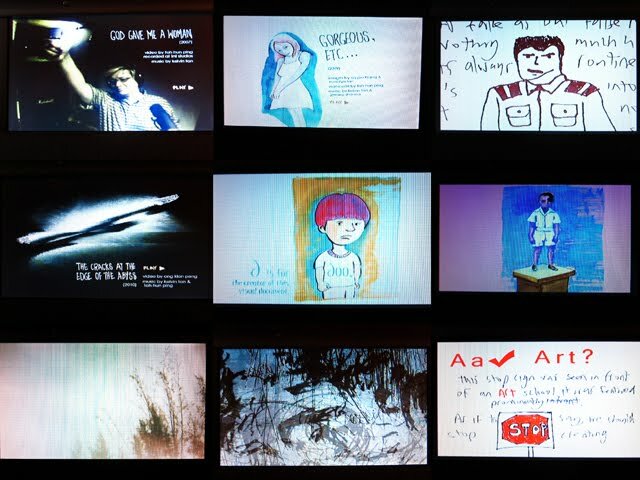 Excerpts from a video work by Toh Hun Ping, which is created with drawings, illustrations and paintings by Sia Joo Hiang. These images are from Joo's visual document "I am Brinsley Bivouac", which is inspired by an unexpurgated version of writer/musician Kelvin Tan's novel "All Broken Up and Dancing". The music is by Kelvin Tan and Justin Lim. EXTOIL is an 11min animation by video artist Toh Hun Ping, made using manipulated film strips as his primary medium; and arranged along to musician Jeremy Sharma’s transliterations of Kelvin Tan’s music. EX.TOIL (excerpts) from Toh Hun Ping on Vimeo.